Artist's rendering of public amphitheater planned by outdoor-advertising company Catalyst Experiential at the corner of Lincoln Highway and First Avenue in Coatesville. The Chester County city of Coatesville is getting a new public amphitheater for its community jazz programs, local school productions, and summer music performances. But for the theater’s builder, outdoor-advertising veteran Thaddeus Bartkowski, the venue’s headline act will be the three digital screens — the largest of them 40 feet wide — that make up the covered stage’s outer wall, facing the busy corner of Lincoln Highway and First Avenue. The Coatesville amphitheater is among the first projects planned by Bartkowski’s new Newtown Square company, Catalyst Experiential LLC, which has deals to build everything from a police station to a fancy dog park for towns all over the Philadelphia area in exchange for the right to broadcast ads on big screens that come with the projects. While cash-strapped cities were already turning with increasing frequency to private funding sources for their public offerings — think “Indego” bike share network and “NRG” subway station — Bartkowski is taking the trend to a new extreme, building ad-supported municipal structures from scratch. Public agencies have been relying on ad revenue for at least as long as transit networks have sold off space on buses and trains for companies to hawk their products to commuters, but the approach has grown increasingly common in the years since the Great Recession, which depleted municipal coffers, said Adie Tomer, a fellow at the Brookings Institution think tank in Washington, D.C. Throughout central Philadelphia, hundreds of trash cans have been installed and are maintained by Needham, Mass.-based Bigbelly Inc., financed by ads on the bins. 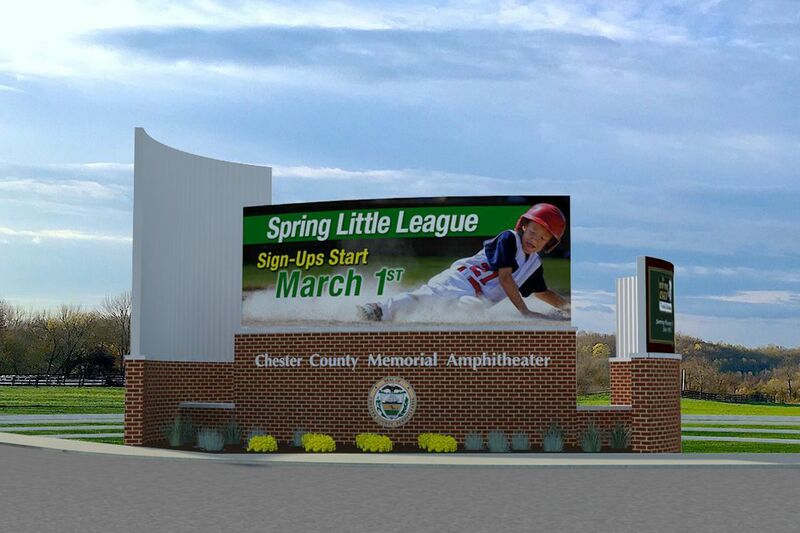 And Interstate Outdoor Advertising LP of Cherry Hill has sought permission to drape big billboards on two Center City municipal buildings. Philadelphia’s city government also partners with Independence Blue Cross on the Indego bike-share program, while New York has its privately run Citigroup Inc.-funded CitiBike network. Intersection, a New York-based media company, sets up cities including Philadelphia, New York, and Newark with wireless internet networks using ad-supported kiosks, while Loom Media LLC, a division of worldwide advertising and public relations giant WPP PLC, is working to put ad screens on electric-vehicle-charging stations in cities and towns. The services and amenities don’t come without a price, though, said Kristen Strader, a campaign coordinator with left-leaning consumer advocacy group Public Citizen. She characterized the trend as an intrusion of private interests onto public space that bombards people with more messages encouraging uncritical consumption. Strader said she was particularly troubled by what may be interpreted as an implicit endorsement of products by the government agencies and services that the ads support. But it may be just such a connection to civic life that companies are seeking when they embrace opportunities to sponsor things like bike-share networks, said Mark Boidman, head of New York-based investment bank P.J. Solomon’s media and technology services division. Artist's rendering of entrance to dog park planned by outdoor-advertising company Catalyst Experiential on Street Road, near Old Lincoln Highway, in Bensalem. Bartkowski started Catalyst Experiential after selling most of the signs owned by his earlier company, Catalyst Outdoor Advertising, to Clear Channel Outdoor Inc. of San Antonio, Texas, and Baton Rouge, La.-based Lamar Advertising Co., reportedly for $85 million to $95 million. At the earlier company, Bartkowski struck deals with cities to buy, landscape, and maintain disused or blighted properties within their borders in exchange for permission to erect digital screens at the plots, where advertisements and public service announcements can be displayed. Catalyst Outdoor has built such “monuments," as he calls them, in Quakertown, Westtown, and Concord. Permits to build another in Paoli were denied by Tredyffrin Township officials amid opposition by neighbors. With his new company, Bartkowski said he’s aiming to do more than just tidy up unseemly parts of town and to "create a use that the people that live and work in that municipality want and would benefit from,” he said. Catalyst’s first project will be a $2.5 million dog park in Bensalem, Bucks County, that will feature grooming stalls, a swimming pool, an obstacle course, and separate pens for different-sized canines when it is completed this fall. Its entrance will be marked by large digital screens under bone-shaped canopies, which will be visible to drivers passing the park’s entrance on Street Road, near Old Lincoln Highway. "It will be the most elaborate dog park in the United States,” Bartkowski said. Bartkowski said he’s also building a police station, an emergency medical services building, and pedestrian bridges in Pennsylvania and New Jersey communities around Philadelphia but declined to share their exact locations until the plans are farther along. Within Philadelphia itself, meanwhile, Bartkowski is hoping to pioneer Catalyst’s approach to dense city centers with what it calls its Urban Experiential Display, a type of high-resolution, customized panel that can mimic three-dimensional textures, similar to the massive screens in the lobby of the Comcast Center building. The company has a deal for a display on a blank exterior wall of the publicly owned Pennsylvania Convention Center at Broad and Race Streets, as well as for one on a private property on the southwest corner of 12th and Arch Streets, across the street from Reading Terminal Market. City legislation has been passed to allow those screens, but they still require Pennsylvania Department of Transportation approval and have not yet been presented to the city’s arts commission and Civic Design Review board, which are steps in its permitting process, Bartkowski said. The Philadelphia-area projects are part of a planned East Coast rollout that is expected to include efforts in Florida, Connecticut, and New York state this year, with plans to begin operating on the West Coast in 2020. In Coatesville, where Catalyst is building the amphitheater, city manager Michael Trio said officials have long wanted to offer residents a more refined meeting place for town events than the bare, grassy plot where the venue is planned, but it has lacked the means to do so. Catalyst’s plan for the site calls for gently inclining semicircular grass terraces where up to 200 people can sit facing a stage structure and a separate building with public restrooms, all maintained through advertising revenue from the project. The venue will remain publicly owned, although the digital screens themselves will be placed under Catalyst’s long-term control, said Trio, who characterized the arrangement as a “win-win" for residents.